In a recent statement UCI's Pat McQuaid stated his confidence in the UCI's quest to globalise cycling and said that soon the ‘Tour of China' will become “more popular” than the Tour de France. With the Pro Tour collapsing and becoming all but an empty program, it is time for the UCI and others to restore some sanity to the forward looking plans to stabilise and grow our sport. Innovation and bold ideas are central to creating a healthy future for any enterprise. For it's part the UCI should be applauded for taking such an approach. Unfortunately the UCI's (Pro Tour) ideas are fatally flawed and they need to completely redesign their ‘grand strategy'. The sport of cycling is particularly blessed with an incredibly rich heritage of races that are woven with legends and hero's stretching back over 100 years. On the road the three Grand Tours and the Five Monuments are like crown jewels that should be protected and nurtured with everything else cycling being fused with this great foundation. In it's efforts to globalise, the UCI seems intent on turning it's back on over a century of history. This is a huge mistake. As an example, the Tour de France is one of the most famous of all sporting events. And it's Yellow Jersey is perhaps the most famous of all sporting icons. The vast majority of the general public know precious little about cycle racing but at least the Tour gives it a face. Anyone thinking that the Tour of China will become more popular than ‘Le Tour' needs to be subjected to the UCI's drug tests! Instead of distancing itself from cycling's great races, the UCI should be finding ways to use them as a springboard to a global program. In tennis every professional considers the Wimbledon championship as the ultimate goal. In cycling stage racers would give anything to win the Tour de France. For single day riders the Five Monuments are their Wimbledon. Much is written about the Grand Tours, and in particular the Tour de France. In this ‘primer' we turn our attention to the Five Monuments. These races along with the Grand Tours will undoubtedly draw more media attention and more spectator participation than anything else that cycling has to offer. For their part the riders will also target these races as “the” ones to win. Consequently it is here that you will see the great battles and the potential for new legends to be born. 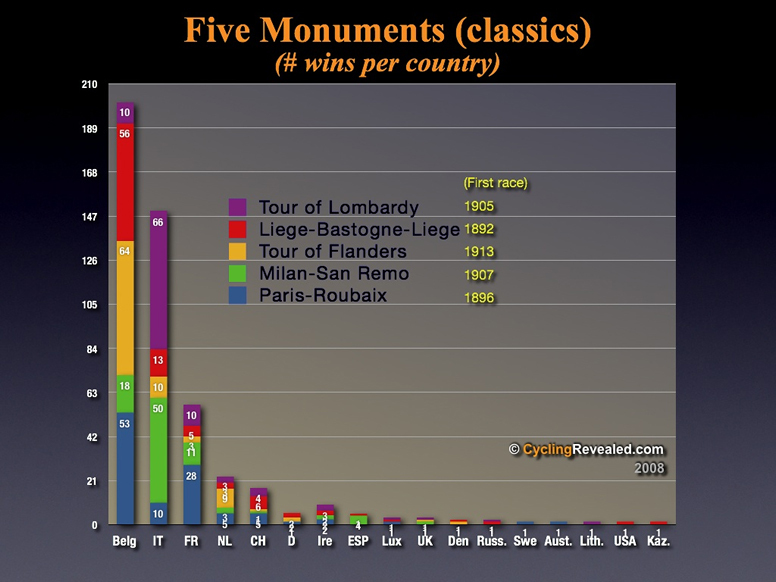 This is why they are called the “Five Monuments”.